Engagement Party Catering With Hog Roast Atherstone! Hog Roast Atherstone can help to make your party go with a bang, even if it’s not Fireworks Night! While we cater many special days of the year, we also cater private parties for birthdays, christenings, retirements, anniversaries, and so much more, as well as corporate hospitality events, charity functions and weddings, of course. We’ve spent many years now ensuring that our customers and their guests are more than satisfied, and not only with great choices and the variety of food offered but also with excellent service from start to finish. We recently catered an engagement party for a couple who wanted to celebrate at home with friends and family. When Georgina called us to book the special occasion for her and her new fiancé Mark, she was concerned that there were too few guests for us to cater, but we actually cater any numbers, whether there is just a handful of people invited or several hundred instead. 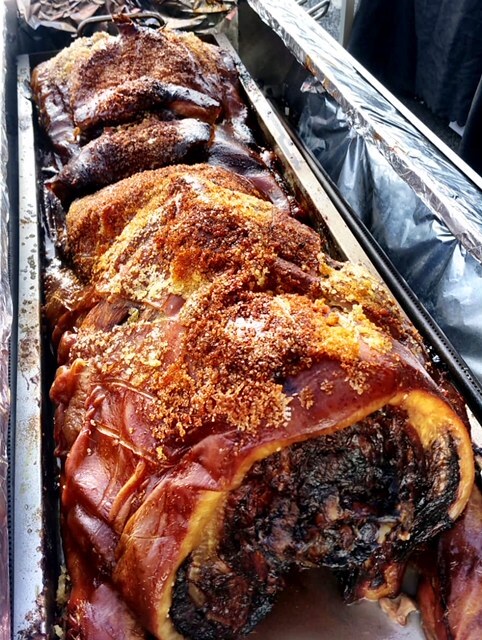 For the 20 guests, our chef and assistant would cook a traditional hog roast at Georgina and Mark’s home, in the back garden, and make delicious pigs in buns for them, as well as prepare our homemade coleslaw and a tomato and mozzarella salad. We have lots of options if you need alternative or additional dishes served like this, with plenty of choice for special diets and to cover personal tastes too. On the day of the party, our Hog Roast Atherstone chef and assistant arrived on-site at the home venue in the early afternoon, ready to set up our equipment in the chilly outdoors. We would soon warm up though, from the heat of the roasting hog, which would spend hours on end sizzling away to perfection. Soon after preparing the pig and setting it cooking, the air filled with unmistakably meaty smells and the couple said they couldn’t wait to dig in with their guests later on. By 5.30pm, all the guests had arrived and had toasted Georgina and Mark in the back garden and it was finally time for Hog Roast Atherstone to serve up some delicious hot food and our freshly prepared salad dishes. Footballing Fuel from Hog Roast Coalville!